In 2013, the Canal Music Fest became a summer concert series, thanks in part to a grant from the Ohio Arts Council. The first and main show of the series was held on June 8, at City Park, in Tipp City, Ohio. 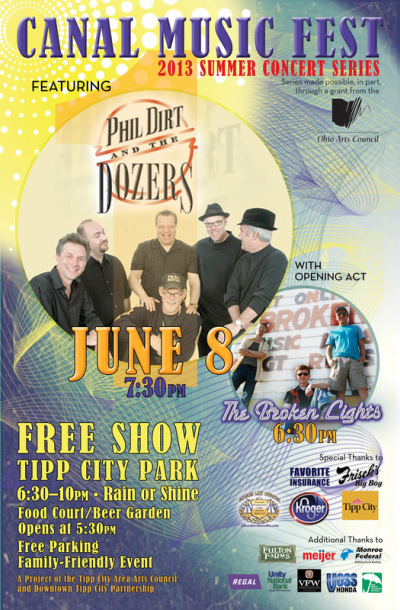 Local band "The Broken Lights" took the stage at 6:30 p.m., followed by our feature act "Phil Dirt and the Dozers". We were once again blessed with unseasonably great weather–74° with 54% humidity! The remaining three installments of the summer concert series returned to the roundhouse area of the park. The second was held on July 13 and featured local band, "Seventh Street". On August 10, we welcomed bluegrass band, "Nightflyer", and on September 14, we closed out with "Serphim" Chamber Artists.